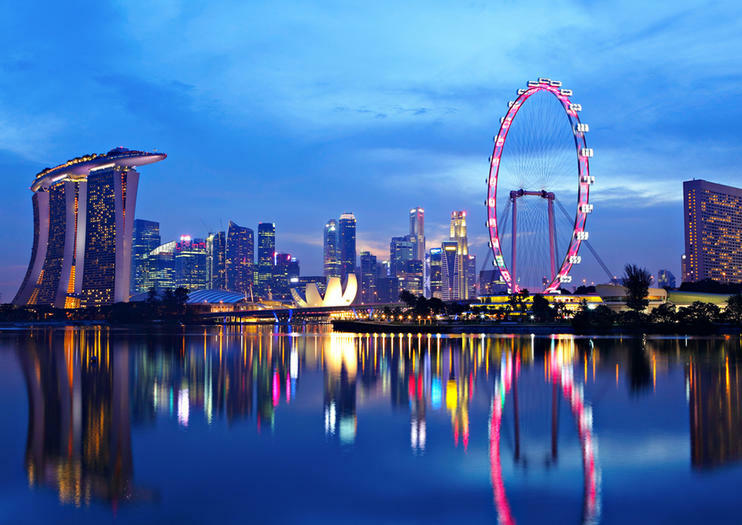 With its soaring skyscrapers, futuristic parks, traditional temples, atmospheric ethnic enclaves, and phenomenal food scene, Singapore is a delight to discover. From marveling at the city-state’s striking architecture to learning how to cook Singaporean-style dishes, here’s how to best enjoy a 2-day stay in Singapore. Morning: The best way to get your bearings is with a guided highlights tour, or—if you want more flexibility—a hop-on hop-off bus tour. Whichever option you choose, you won’t want to miss Marina Bay, the waterfront Merlion Park, Chinatown, and Little India. Afternoon: With theme parks, ziplines, an aquarium, and several beaches, there is no shortage of entertainment options at Sentosa Island. Guided tours of the resort island often include transportation via cable car and admission to multiple attractions. Alternatively, explore Sentosa by Segway tour, cruising by beaches, a 19th-century fort, and a more than 11-story skywalk trail that puts you at treetop level. Evening: As darkness falls, discover Singapore’s wild side on the Night Safari. This nocturnal open-air wildlife park has tigers, lions, and elephants who roam in naturalistic enclosures designed to replicate the animals’ natural habitats. There’s also an on-site restaurant offering a buffet dinner. Morning: Singaporean cuisine is the stuff of foodie legend. Find out how to re-create Singaporean staples for yourself with a cooking class. Learn how to concoct the perfect bowl of laksa (noodle soup), satay, or Hainanese chicken rice before sitting down to eat your freshly cooked creations. Afternoon: With your stomach sated, it’s time to feed your mind with a historical tour of Singapore that focuses on its harrowing World War II history. Visit sights such as the Changi Museum, and learn about the Japanese treatment of Allied prisoners of war. For a more light-hearted alternative, tour the Tiger Brewery and sip samples of different beers produced by the popular Asian brand. Night: Go all out for your final night in Singapore. Step aboard a bus for a gourmet food tour, where you’ll be served multiple plates from a Michelin-starred Singaporean restaurant. For an even more romantic option, take dinner to new heights with a 4-course meal aboard the Singapore Cable Car on Mt. Faber. Go sightseeing at your own pace with this Singapore hop-on hop-off tour. Choose from either a 24-hour or 48-hour ticket, and enjoy the flexibility to explore the city across two different bus routes. While you’re on the open-top double-decker bus, listen to narration about the sights, and then hop off when you want to visit attractions on your own. Explore some of the many family-friendly attractions on Singapore’s Sentosa Island during this afternoon tour with a guide. Several resort activities are included, starting with a cable car ride to the island. On the island, see Images of Singapore LIVE, the Wings of Time show, Madame Tussauds, and Sentosa 4D Adventureland for Journey 2: The Mysterious Island. Enjoy an array of wildlife and entertainment experiences, from wax figurines to fireworks. Don’t miss the Singapore Night Safari, one of Singapore’s top family attractions, located next to the Singapore Zoo. You’ll explore the jungle park on an open-air tram, catching sight of nocturnal animals in authentically created habitats. Then follow a guide on a walking trail to see leopards and other wildlife up-close. You can also watch one of the nightly shows, and you have the option to upgrade to include dinner at Ulu Ulu Safari Restaurant. Discover the major sights of Singapore on a private, half-day tour with a personal guide. You’ll see attractions like the Parliament House, visit districts like Chinatown and Little India and admire the beauty of Marina Bay. This is a great way to orient yourself with the city at the start of your trip. Choose your departure time and pickup location when booking. Visit Changi Chapel and the site of the old Changi Prison on this historical tour that focuses on the Japanese Occupation of Singapore during World War II. With an experienced guide who provides insightful commentary about this somber period of history, you’ll learn about the prisoner-of-war camps that once stood here, see landmarks like the Johore Battery and Selarang Barracks, and more! There’s no need to choose between fresh dining and Singapore after-dark sightseeing on this gourmet dinner bus tour of the city, which features Michelin-rated fare at on-board dining tables. Taste seafood claypots, flavorful vegetables, and meats in rich sauces as you drive past key Singapore sights such as Merlion Park and Chinatown. Tour includes a stop to watch the sunset at Keong Saik Road and a visit to Gardens by the Bay for the Garden Rhapsody light and sound show. See the Singapore skyline from above with sky dining aboard the Singapore Cable Car on Mt Faber. Luxuriate in a 4-course dinner during three rotations on this historical cable car in the sky. Enjoy a welcome drink and wine with your set meal, along with priority boarding. You'll have incredible night vistas during your 1.5-hour ride in a private dining car with that special someone. Soar through the skies on a trio of ziplines at Singapore’s Mega Adventure Park. Race friends on side-by-side lines or fly solo above a jungle setting that offers incredible views of the South China Sea. The attraction is located on Sentosa Island, and tickets include equipment as well as all the instruction you’ll need for a safe and awesome experience. Dive into Singaporean culture at a cooking class, where you’ll learn how to make authentic dishes with local instructors. Everyone from culinary novices to top chefs is invited to this 3-hour experience, during which you’ll create Singapore-style favorites like laksa and Hainanese chicken rice. When the cooking is over, sit down to enjoy your meal with your fellow food lovers. This class is limited to 12 people to provide a small-group experience.